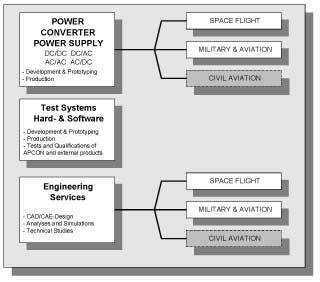 Apcon AeroSpace & Defence GmbH was founded in 1995 as a spin-off of EADS (former DASA). Due to its former engagement inside DASA, the Company now has more than 30 years of experience in designing, testing and building of power supplies. We specialize in development, design and production of customer-specific high reliability power supplies for military, aviation, and space application. Other services, as e.g. analyses or testing, and other types of high-reliability electronic devices can be provided as well. The medium- and long-term company strategy of APCON is providing customer specific high end system solutions as a sub-contractor for your mission. APCON is ISO-9001 certified for its quality management. APCON is one of the market leaders for high tech power supplies. - Worldwide network of business partners.